Asegúrese de visitar también el primer curso, Configuración de una revista en OJS 3. Si está interesado en traducir un curso de la Escuela PKP a su idioma, contácteme! Thanks again to the hard work of translator María Elena Sánchez Salazar, with the support of the editorial team at the Institute of Geography at the Autonomous National University of Mexico (UNAM), we have the second PKP School course in Spanish — Editorial Workflow in OJS 3. Thanks as well to Raúl Marcó del Pont Lalli and Claudio Amescua of UNAM for supporting this translation. 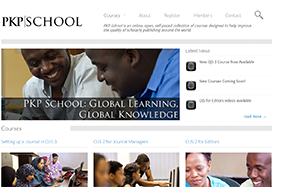 Be sure to also visit the first course, Setting up a Journal with OJS 3. If you are interested in translating a PKP School courses into your language, please contact me!